Cord-cutters and currency swings combined to pinch the global TV network's results last year. What: Discovery Communications'(NASDAQ:DISCK) stock fell 25% during 2015, according to S&P Capital IQ data. Shares had been trailing the S&P 500 by just a few percentage points until the second half of the year, when the TV network started significantly underperforming the broader market. 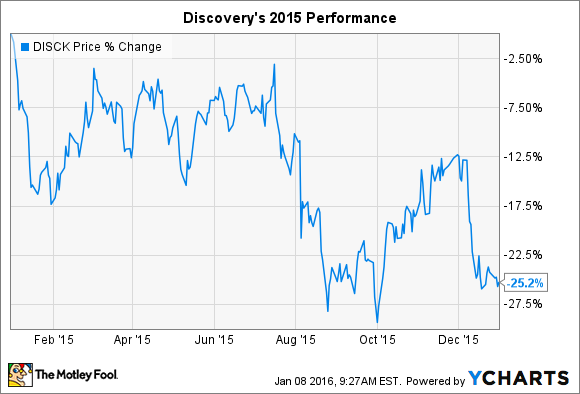 So what: Two major trends combined to weaken Discovery's results last year. First, as foreign currencies slumped against the strong U.S. dollar, its reported sales and profit growth fell. Revenue dipped by 1% in the third quarter, but actually would have risen by 8% after accounting for the exchange rate swings. Currency changes have had a hugely negative impact on profits as well. Discovery's growing international business reported a 21% dive as adjusted earnings fell to $218 million from $277 million in the year-ago period. But 17 percentage points of that drop can be attributed simply to exchange rate switches. While international currency problems are temporary, investors' bigger worries center on Discovery's core business in the U.S. that relies on increasing TV subscribers to power ratings gains, which in turn help deliver rising distribution fees and advertising revenue. That virtuous cycle is working in reverse at the moment. The network's ad growth slowed to a crawl last year as ratings fell due to a shrinking pool of cable TV subscribers. Discovery isn't alone in this struggle. Time Warner's (NYSE:TWX.DL) TV broadcasting business was its worst performer last year, logging the same meager 2% growth that Discovery managed. Like Discovery, Time Warner managed that gain through price increases rather than a growing pool of subscribers. Fewer prospects for its TV networks was a big reason why Time Warner also trailed the market significantly in 2015. Now what: Discovery's international business, while the source of less reported profits at the moment, should power strong growth over the years ahead. In fact, CEO David Zaslav and his executive team believe that segment separates the company from its many competitors in the industry. "Discovery is like no other media company, propelled by our unmatched global infrastructure," he said while discussing third-quarter results in November.